This is one of those dishes that is at once unbelievably simple and super-duper tasty. 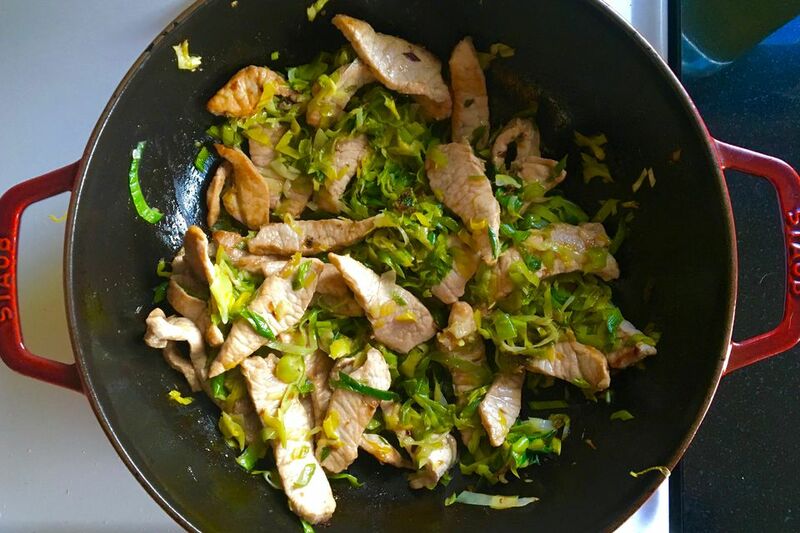 Just lean pork, sliced leeks, some soy sauce, and a bit of toasted sesame oil. Seriously, it's just that simple. You might find a side of sautéed greens and a bit of steamed rice are the perfect accompaniments to this dinner. Another benefit of its simplicity is everyone can dress it up as they like: adding hot sauce, or more soy sauce, or a sprinkle of fresh cilantro, or even some chopped tomatoes (sounds weird, but tastes great!). Trim off and discard any fat from the pork. Cut the pork into about 1/4-inch slices. Cut those slices into thin strips. Pro tip: For easier trimming and cutting, put the pork in the freezer for about 20 minutes first. Trim off and discard the root end of the leeks. Cut each leek in half lengthwise. Thinly slice the leeks on the diagonal. Slice up the white, light green, and dark green parts — stop when the dark green part gets ragged or super stiff. Put the sliced leek in a large bowl and cover with cool water. Swish the sliced leeks around to rinse off any dirt or grit. Lift the leek slices out of the water and drain on a clean kitchen towel or layers of paper towels. Note: Be sure to lift the leeks out of the water, leaving the dirt and grit behind in the bottom of the bowl; do not pour everything into a colander, which would dump the dirt and grit back onto the leeks! Heat a wok or large frying pan or sauté pan over high heat. Add 1 tablespoon of the canola oil. When the oil is hot, add the leeks. Cook, stirring frequently and scraping any browning bit from the bottom of the pan until the leeks are tender and starting to brown, 8 to 10 minutes. Transfer the leeks to a plate or bowl. Return the pan to the heat, add the remaining tablespoon of oil. When the oil is hot, add the pork. Cook, stirring frequently until cooked through and starting to brown, 3 to 5 minutes. Add the leeks back to the pan. Stir to combine everything and heat the leeks back up. Serve immediately.